BRYAN EATON/Staff photo. 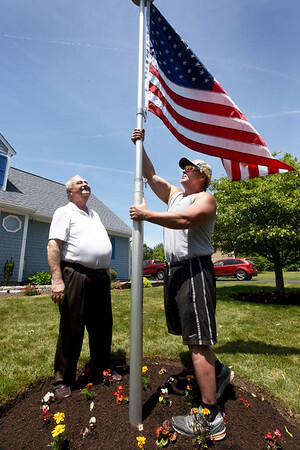 Vietnam veteran Ed Power, left, watches as his landscaper of 20 years, Mike Beaton, sets up a telescopic flag pole. Power has had a flagpole on his property since he bought the home at Quail Run Hollow in Newburyport over 30 years ago. The old pole was in disrepair and he ordeded this new one that doesn't need a rope to hoist and Beaton, himself a veteran, offered to install it for him.